Reaction to LIVE CARGO at last years Tribeca film festival was very mixed. Some people loved it, some hated it and most of the others were split about the film and it's changing narrative. The plot concerns an American couple who travel to the Bahamas in order to get over a tragedy that is in danger of fracturing their relationship. As they attempt to heal they get involved with a young man who is involved in a human trafficking. This is a beautifully shot black and white film that is very serious abut the stories it is telling. 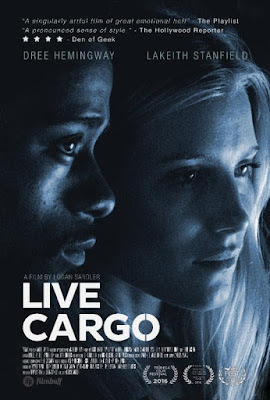 It is full of gorgeous shots and sequences every image, sound and line of dialog is full of meaning.Rarely have I encountered any art film as intense about being about something as LIVE CARGO is. Its so insistent that it is about something that I kind of wanted to slap it and tell it to take a chill pill. This film is very tightly wound. This is kind of an interesting misfire.